Photo by Peter Blanchard via Creative Commons. If drivers speed recklessly on your residential street and you’d like to do something about it, you or someone from your street should attend the Neighborhood Traffic Calming Program meeting on Wednesday, May 25, from 6:30 to 7:30 p.m. at the Beacon Hill Library. Neighborhood Traffic Operations (NTO), a workgroup within the Seattle Department of Transportation (SDOT), is hosting the event to meet with neighbors who are concerned about speeding on their residential street. NTO representatives will present a brief overview of traffic calming options (such as chicanes, traffic circles, radar speed signs, etc. ), what steps a neighborhood must take to be considered for traffic calming, the criteria staff use to prioritize projects, and possible funding sources. They will also teach the proper use of radar speed guns. If you wish to enroll your street in the traffic calming program, a representative from your street must attend this meeting or one of the other meetings (the next one is in Queen Anne in July). 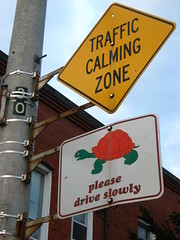 You can find more information about the traffic calming program on the SDOT website. The Beacon Hill Library is located at 2821 Beacon Ave. S.
I live on 14th and South Hinds Street, an area right by the freeway exit. People often drive very fast on this almost one-lane neighborhood street, in order to cut down to the freeway (thus bypassing 15th and therefore saving seconds of time). Since we don’t have sidewalks, and the road has two curves, it is very dangerous—poor visibility, and literally nowhere for pedestrians to go. When even this shortcut takes too long, they also often bypass even 14th/South Hinds Street, and instead cut at high speeds through my alley. This is even worse, since it’s very narrow and abuts right next to all property—and of course, no alley sidewalks as well. A few days ago, I was walking in the alley to my house (I take the alley due to lack of street sidewalks) when a man, smoking and driving a silver Lexus SUV, sped towards me up the alley from the freeway. Please keep in mind that I am very obviously pregnant, which makes me slower than normal. Regardless, apparently this short pregnant pedestrian didn’t move out of “his” way fast enough, so, barely stopping, he rolled his window down and shouted “this road is for cars.” No sir, it is not. It is an alley. It is for property access. There are actual roads to the left and right of this alley. This kind of thing is, unfortunately, common. I feel this is very unsafe but don’t know what to do. My dream would involve a speedbump or two in the alley to prevent speeding impolite people shaving off fractions of a second of their drive by taking the alley instead of a road, and sidewalks on the curved stretch of South Hinds Street. Does your Broadstripe service meet expectations (yet)? We have been taking steps to improve High Speed Data services to your area. We have been systematically troubleshooting and repairing our nodes to provide exceptional service to our subscribers. Please contact us directly at earningourstripes@broadstripe.com so we can confirm if you’re (sic) concerns have been resolved with our recent upgrades or if we can do anything further to assist in resolving any on-going service concerns. We’ve been pretty lucky here; we have not experienced the lengthy periods of complete internet outages many of you have reported and have repeatedly gone back and forth with Broadstripe over (many to the point of giving up on cable broadband entirely). In my recent experience, I have seen some improvement: speeds during peak usage periods (evenings) are not nearly as horrible as I’d seen in September, but they’re usually only a tenth of the advertised speed of 15 megabits per second. At off-peak times, I have seen very brief peaks above 10 megabits near the beginning of a single download, but after a megabyte or two, the speeds appear to be throttled down to an average somewhere around 3 megabits, one fifth of the advertised rate. about 15 seconds at 500 kilobits per second (500Kbps). about 8 seconds at one megabit per second (1Mbps). less than one second at ten megabits per second (10Mbps). I encourage you to run your own tests — real-world tests like downloading software updates or loading large web pages as well as speed tests performed through sites like speedtest.net and Broadband Reports — and report your findings in the comments. Those of you who have experienced general outages: have they become shorter or less frequent? Has their support staff become more responsive and solved your issues? Please also send your experiences back to Broadstripe.